Fantastic position to visit Malaga a most interesting city. The rooms are comfortable well decorated but the lack of draws is a fundamental omission even if is more utilitarian than luxurious. The bathrooms are well equipped but what stupidly impractical round soap also poor quality . With so many places to eat around the hotel there is no need to use their restaurant. Thank you for sharing your experience at the AC Hotel Malaga Palacio by Marriott. We are happy you enjoyed your stay with us and that the facilities and service experience were what you expected and deserve. Our location it´s really good to enjoy old city and surroundings areas. We take note of your comments which will go to the hotel management team, with the purpose of continuing to improve day by day. Thank you for staying at AC Hotel Malaga Palacio and we hope you choose to stay with us again whenever your travel needs bring you back to Malaga. This hotel is in an excellent central location next to the cathedral, and a stroll down to the waterfront. Taxis available instantly outside the hotel whenever needed. The staff were all very polite and efficient, doors always being held open for me at the main entrance, reception desk was always well staffed. Breakfast offered plenty of choice, freshly squeezed orange juice, peach juice, strawberry or chocolate smoothies, six different cereals, yoghourts, fresh pineapple and melon, ham and cheese selection, croissants, waffles and pancakes with chocolate sauce, different types of bread. For cooked breakfast, there were boiled eggs (which were cold), and containers of fried eggs, bacon and baked beans on heaters. Strangely, these containers always had their lids taken off and I always had to put them back on to retain the heat. The coffee machine was a bit of a struggle. The bedroom was very nice, lovely modern bathroom and proper shower, the bed was so comfortable and also very wide. I had a balcony and enjoyed watching the fabulous sunrise from there each morning. One can order food for the room and also at the bar area. I had lunch on the roof terrace twice and the food was really good, classy presentation and excellent quality. I was put off swimming as the small pool was surrounded by so many people drinking noisily at tables right round the pool but it was nice to look at. We appreciate your detailed comments and are delighted to hear that you had a great stay. With a spirit to serve, we take great pride in exceeding your expectations, paying special attention to the attention received from our team. Your feedback is integral to our ability to continue to improve our service. Thank you again for your time and kind words and come visit us again soon! Great views from the rooftop bar and very reasonable prices. My wife and i visited the rooftop bar a couple of times and were impressed by the views, the service and the prices - well worth a visit. We weren't residents but the bar was a great find and we'll be back. We appreciate your time in sharing your experience with us. We are happy you enjoyed a drink in our roof top Terrace, really allows to see an awesome panoramic of Málaga, Cathedral, Gibralfaro Castle el and harbor with the best atmosphere. Great view but average food for the price. The location of this restaurant is amazing with incredible views of Old Malaga and the Marina. The food, for the price, was only average. My veal steak was not cooked to my instruction but I did not want to make a fuss as I had treat my sister and partner to a meal out. We are happy you enjoyed our roof top Terrace, really allows to see an awesome panoramic of Málaga, Cathedral, Gibralfaro Castle el and harbor with the best atmosphere. However, s a valued guest we see that there is room for improvement based on your feedback. According to your score and comment, we see that we have some aspects that we have to improve, we take note of it. Please accept our apology for not meeting your expectations during your stay. Thank you for staying at the AC Hotel Malaga Palacio and we hope you choose to stay with us again. Stayed for a week with family. The rooms are spacious and nice and the location is excellent. But have to give very low grade because they did not take the problem with cockroaches seriously. Even the cockroaches avoid light and contact with people we were able to take picture of them. We showed the photo to the personnel and they did give us a new room. But this room was just one room away from the original room and surprise, surprise had also cockroarches which we again caught to a photo. Again we were moved to another room. The lady went into the toilet and said that there were no cockroaches there and could not be, because all water pipes were sealed. I'm not sure if the lady didn't know that cockroaches do not need much space and can move through tiny holes. They can hide even under electrical switch. She obviously didn't know that 'if you see one cockroach, there's hundreds more' and getting rid of them in my home country is really expensive and obligatory. And cockroaches do like to lay their eggs e.g. to suitcases. I really don't want them as travel souvenir. They didn't even apologize us. We felt like the lady thought we're stupid even to complain. 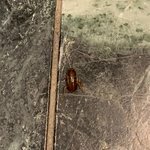 I would avoid this hotel and it's restaurants, since cockroaches are known to spread diseases and contaminate food. Thank you for taking the time to share your recent stay at the AC Hotel Malaga Palacio. We are happy you enjoyed your stay with us, our location really allows to see an awesome panoramic of Málaga, Cathedral, Gibralfaro Castle el and harbor with the best atmosphere. We always consider feedback from our guests is a very important tool for us as it enables us to pinpoint our weak areas and to improve accordingly. However, we do not understand part of your comment. Since after the incident we offered a change of room on 3 occasions, we sent attention to your room as an apologies, and we apologize repeatedly. As you can imagine, I am very dismayed to hear that we did not reach your expectations during your stay with us. I can imagine how frustrating this must be for you and apologize for the inconvenience experienced. Please excuse us for the inconveniences caused and feel free to contact us should you have any additional comments or requests. Fun Police on Patrol for a €8 entry fee. Having visited this bar on a previous trip to Malaga I was looking forward to a drink with that view and our children were keen to visit again to have a dip in the pool. Now I understand that the pool is for residents only, but it was indicated that there “could be a chance” by a friendly member of staff. Let me paint the picture, it’s late February and the good people of Malaga are dressed for winter ( warm coats, trousers and the odd scarf) and as visitors to Southern Europe a February day is as good as some summer days in the UK and the kids were desperate to try out the water. Sadly the staff at the pool were particularly aggressive and failed to use any ability to read the situation. Nobody else had even the slightest interest in dipping their little toe in so there wasn’t a chance of an over crowding issue. They were firmly instructed that they must not even touch the water so even the fun of dipping their feet in was squashed. Had we not been committed to the bar due to the €8 access charge (this gives you one standard drink) we would have spent our time elsewhere. Your staff made us feel rather unwelcome. Shame on you Marriott. I would advise you to work on teaching your team about reading the situation. There are other roof top bars in Malaga and I look forward to trying them out on my next visit. The pool is for the exclusive use of the guests, that the payment of € 8 is only for the consumption, not for the right to use the pool. Also, your request was outside of the pool hours. That our staff simply indicated those standards, always with a smile and never in an aggressive way. That we recommend that for future occasions to be able to ensure the use of the pool, stay with us and you can make use of it throughout the year and during the pre-established schedule without any problem.